Rebelscum.com: Hasbro: The Amazon Deal Of The Day Is The Vintage Collection Rogue One Imperial Combat Assault Tank*! 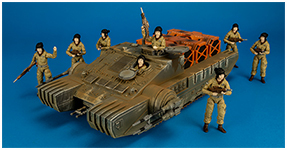 Hasbro: The Amazon Deal Of The Day Is The Vintage Collection Rogue One Imperial Combat Assault Tank*! Click here to save over $30 on this incredible vehicle. *=Rose's not included. December 7, 2018 Hasbro: Huge Rollback On The Vintage Collection Rogue One Imperial Combat Assault Tank!